Designed to fit standard B.I.A. bolt pattern, without drilling holes or making modifications in the boat or motor. 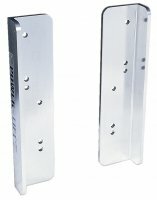 Made of 3/4 and 1/2 inch aluminium alloy extrusions and fastened with stainless steel fasteners. Ideal for fresh or salt water use. No welds or castings to break. 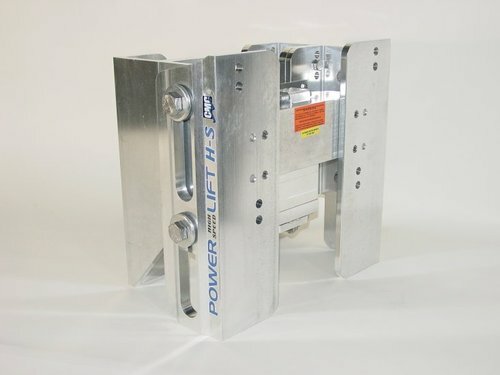 The dependable, self contained and water proof, hydraulic actuator has 2250 kg of thrust. More than any other transom jack. No problem to lift even a V-6 motor at full throttle. 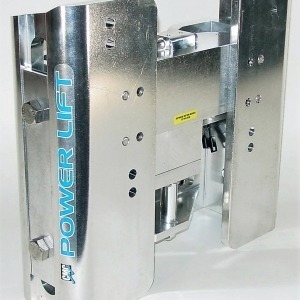 The actuator is mounted inside the structure of the Power-Lift, yet it is fully accessible without removing the engine. The hydraulic actuator is completely self-contained with its own fluid reservoir. It contains a permanent magnet motor for more power and R.P.M., a no-leak seal and wiper seal that keeps dirt and water out of the working parts. The system is made of 100% non-ferrous material which makes it impervious to saltwater and freshwater. The roller assembly contains a stainless steel 3/4″ pin with aluminium-bronze alloy rollers. Have a look at other manufacturers units that are offered on the market, and you will soon see how stressed they could become when a 300HP outboard is being hammered through rough water. 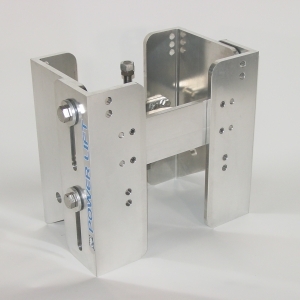 Over 160 Hydraulic Jack Plate units sold by us in Australia over the last few years, and no problems. 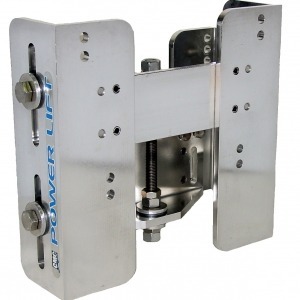 The PL-65 is rated for V-6 motors and smaller and gives you 5″ of vertical travel with 1-1/2″ of adjustment on the motor bracket and 1-1/2″ of adjustment on the transom bracket.